For the past 27 years, the brilliant Vince Clark and Andy Bell have been a newspaper classified success story. Answering Vince Clarke’s call for a singer, Mr. Bell won the job, making them synth pop and LGBT heros, and Clarke’s longest running, most successful act. I feel I should break this review down categorically, because there was a LOT going on in terms of interaction, sights, and sounds. In a kind of mildly Gothic, genre-crossing stage explosion, the set consisted of a twisted round symbol, with Vince Clarke’s podium a gargoyle with glowing red eyes and an elevated stage section for the back-up singers. The result was part burlesque, part weird, and all fabulous. Clark donned a shiny red fedora and sequined red suit, the back-up singers wire feather headdresses and sequined red bustiers, and Andy Bell was clad in a fuschia sequined blazer and gladiator-esque helmet. The intro was a slower number, making for Bell’s disrobing and revelation of a tight vest corset all the more dramatic. The crowd became looser and more inflamed with Always. Perhaps it was the revelation of his full bicep gun-show that did us in–but more likely it was the fact that his forceful voice sounds better than ever now. One of the funniest parts of the show was when Vince had to physically cut Andy’s corset vest off while Andy exclaimed “He’s so sweet”. There was a short costume change into a simpler (and more comfortable) t-shirt and sunglasses, but not before a period of shirtlessness. Unsurprisingly, the dance moves were flaylingly enthusiastic from all fronts. First, from all of the die-hard Erasure fans that had made the trek to the ill-located Sound Academy. Second, from the prancing muscular full body moves of Andy Bell. 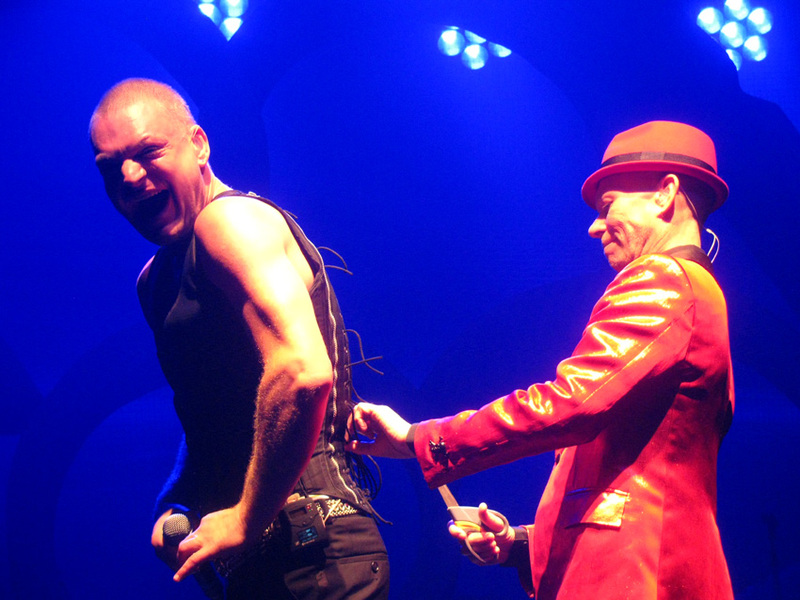 You’d be hard-pressed to find a more belt-worthy chorus than from a classic Erasure song. From my favorite (Chorus) to Chains of Love to Love to Hate You and A Little Respect, there is nothing quite like singing out loud to Andy’s powerhouse chords. I also maintain that no one writes a more touching love song like an 80’s synthpop band. I’ve bolded my favorite moments from the show below–and although none of the newer songs are really included in there, it’s important for people to know that they are totally listen-worthy with beats that can compete with any new act. 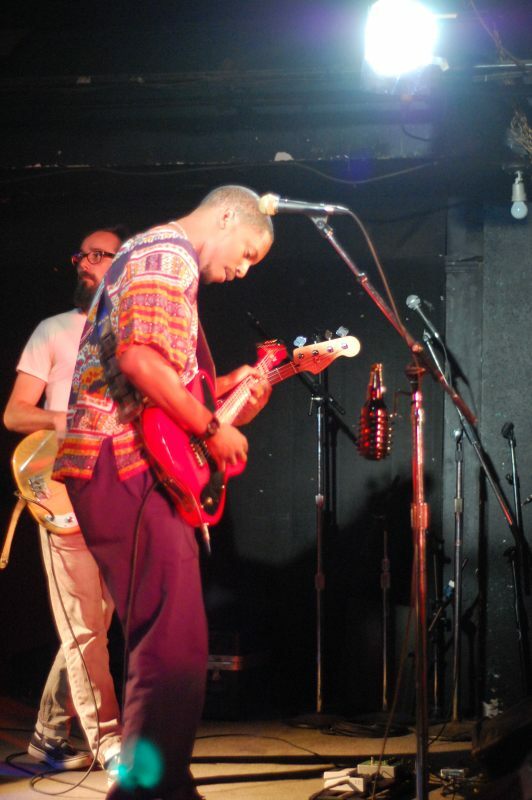 Toronto – Last Thursday Austin-based Black Joe Lewis and the Honeybears brought their energetic brand of horn-infused blues rock to the Horseshoe. There were sweet red guitars, badass brass, sing-a-alongs, and beer swillin’. It was a supremely fun show, despite the fact that I lost my earmuffs shortly after arriving. As a lover of the blues, it’s so refreshing to see bands from America’s south ply their craft up here. They are steeped in the culture of the blues in way that we northerners aren’t. They grew up with it, and Joe Lewis’ confidence with this kind of music was palpable. The Honeybears are attempting to avoid the term “soul revivalists”, but the blues-infused rockers do have a sharp brass section. When you throw them in the mix, the result is music that’s both great to listen to, and groovy something fierce. If there was one weird part of the show, it occurred approximately 27 minutes into the set. The brass section took a break, and Joe and his band slid into some harder straight-up rock. I’m not sure if Joe was experimenting with some new sounds, or playing some really old stuff before he had his horns. It was a little edgy, and it seemed like the crowd didn’t know what to think of it. Thankfully, the horns came back soon after, the groove resurfaced and everything was as sweet as, well, honey. I have a very soft place in my enlarged heart for start-up musicians (and I suppose at some point, everyone is a start-up). Call me the equivalent of a patron-of-the-arts Flo Nightingale — there is something I can’t quite resist about people fiddling around in their parents’ houses, eventually graduating to blogosphere public release, and a gig at a dive bar. They might be the next big thing, and they might not. Life is full of randomness, and the thing I like about these music makin’ kids is that such successes or failures seem irrelevant, because either way there is some force within them that is compelling them towards creative expression. There’s a purity in that goal that I find refreshing because it is the very definition of artistic innocence. Foxes in Fiction‘s Warren Hildebrand fits this bill to a tee, so it should come as no surprise that I was willing to slug it out on a late Thursday night. I wanted to see what this kid was all about, seeing as he’s garnered some attention from Pitchfork (an accomplishment that the relentless show promoter would not let go, but hey, he bought me a beer, so maybe I should let go of the fact that he sounded like he was promoting a liquidation sale in Brampton), and seems to be an all-round nice kid. I have to admit though, I very much lamented the space that he had to play in. I don’t know if any of you have had the pleasure of going to Tiger Bar (whose name seems counterproductive, seeing as the upstairs part has a bar as well, though at least the bartender here actually responds to you when you call–more than I can say for the dickwad upstairs), but it evokes the feeling of standing in someone’s dodgy basement. Plastic lawn chairs are scattered everywhere, there is garden latticework stapled to the ceiling, and a smell that competes with the Boat’s overwhelming mustiness. On top of that, there is the serious design flaw of having the bar’s supply room smack dab in the centre of the stage, a feature that poor Warren had to compete with throughout his set. As for the set itself, it started off pretty rockily. Warren is a one-man show, and I sincerely hope he reconsiders this set-up as he progresses, because as our friends from Zaza have commented, requiring one person to play a bajillion different band instruments eventually becomes akin to, “dancing around like a clown onstage”. The first song in his set started off with an oddly long sample that I think was supposed to sound like the beach, but maybe it was wind blowing (there were a couple of instances in which his sample was offbeat his actual guitar playing). Either way, I wasn’t sure what I had committed myself to despite liking the three songs I had skimmed beforehand. But soon after he started in on his guitar, I quickly realized that we had a homegrown next generation Bradford Cox (Deerhunter, Atlas Sound) on our hands. You would think that I of all people would be receptive to any musician overly derivative of Coxy, and I am. It’s just that so many of the songs I had heard played on the du-woppy flavor of songs like Walkabout (Atlas Sound’s collaboration with Panda Bear), I was left wondering if the kid had any individual musical range whatsoever. He proved me wrong with his last couple of songs, though. One called Rainfall particularly stood out, which he awkwardly dedicated to his friend Ryan. His entire family was in attendance as well, and boy were they ever conspicuous. His mother, grandmother, and siblings attended with a carafe of red wine they were all sharing. Warren even dedicated a song to his “Nana”, and I can’t lie. That warmed the cockles of my heart (the support he enjoyed from his family almost made up for the fact that the band that went on before him were obnoxiously talking throughout his entire set). I generally give a thumbs-up to the music. You can listen for yourself by downloading the album for free here, but as the Pitchfork review brings across, this is basically more or less an extension of Atlas Sound’s Logos. In terms of the actual stage presence / connection with the audience, I felt the kid was shortchanged. There were only about 15 people in the audience, many of whom I’m certain were personal friends, acquaintances, or blood relatives. In spite of his incredibly stilted awkwardness, he did make some attempts to reach out and touch something only to be met with a fistful of air. All I can say to young Warren is that I see a lot of potential here. Keep your nose clean, keep making music you love, practice in public, stay humble, and give everyone reason to believe in what you’re doing beyond riding the Pitchfork wave. I want to see another B. Cox, not another Nathan Williams (Wavves). Toronto Fringe Preview: The Carnegie Hall Show! Last summer I wrote a review for a SummerWorks improv show called Impromptu Splendour. This review basically became a vehicle for me to express my man-crush on cast member Ron Pederson, and to pine for the days back when I used to live in Edmonton and he was one of my favourite local performers. The nostalgia! 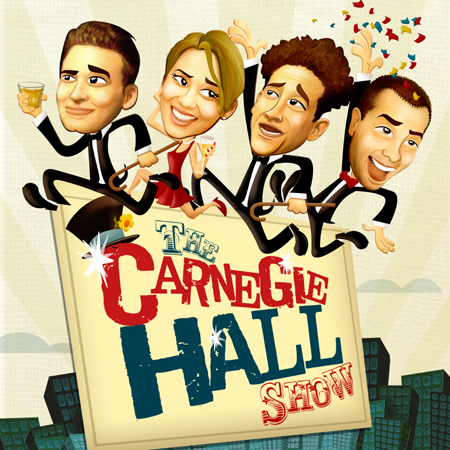 This summer, Ron and his two co-stars from Impromptu Splendour, Naomi Snieckus and Matt Baram, along with Chris Gibbs and Waylen Miki, are bringing their (apparently) regular improv show “The Carnegie Hall Show!” to the Fringe. I say apparently because I know little about it, but according to their website it’s every Wednesday in Kensington Market. “Matt Baram – ‘Second City’, ‘Impromptu Splendor’, ‘Monkey Toast’, ‘Ghost Jail Theatre’, and so many more! Throw a stone at any of Toronto’s best improv shows and you’ll probably hit Matt Baram. But why would you do that? What’s wrong with you? “Ron Pederson – Ron Pederson has appeared across Canada with the country’s most distinguished theatres. He spent 8 seasons as a core member of the Improvisational troupe Die-Nasty, the improvised soap opera and 3 seasons in the cast of Fox’s MADTV. But don’t let his baby-face fool you, he’s a menace! “Naomi Snieckus – Naomi Snieckus is one of the most accomplished comedy actors in Canada. From Second City to Canstage to the big silver screen she’s done it all. Even her TV commercials have a devoted cult following. But don’t let her talent distract you from the fact that she’s a real knockout!! “Chris Gibbs – Perpetual Special Guest – Street-acrobat turned overweight comedian Chris Gibbs is British! His one-man shows are mainstays on Canada’s fringe festival circuit, where he’s well known for his improvisational approach, turning poorly-written pap into comedy gold! See? They even write funny press releases. Also, they have credentials. Their show will be good. You could even go to all their shows and they’d be different every night. You would miss a lot of other stuff at the Fringe if you did that, though. I’m not saying it’s a bad idea, I just think that you might want to consider it a little longer before you commit to it.